Resin embedding is traditionally performed via sequential applications of a graded series of solvent/resin mixtures . The procedures are time consuming (see also ) and the chemicals used can pose health hazards. In addition there is an amount of waste, usually containing both solvent and resin and often larger in volume than the polymerized specimens. When processing large numbers of samples there is also hands-on time to consider. Finally there is the risk of losing specimen material especially in the exchange steps with high viscosity resin. These goals were achieved by eliminating the step-procedure and removing solvent by making use of its volatility. Common solvents for dehydration and embedding are highly volatile whereas most resin components do not evaporate readily. Evaporation depends on the kinetic energy of solvent molecules, the degree to which solvent is held back by the resin and how easily molecules can stay in the gas phase (saturation pressure). Temperature plays the most prominent role, next to vacuum pressure and the concentration of 'solvent' gas molecules in the gas phase over the samples. Evaporated solvent needs to be removed or diluted by flushing air over the liquid surface at set intervals. To be able to have full control over temperature, pressure and flushing with fresh air, an instrument was developed that achieves these goals, the EMS Poly III. At the heart of the instrument is a specimen chamber that is temperature controlled over a range of 10°C-70°C. The pressure in the chamber can be reduced from ambient pressure to a controlled level as low as 10kPa with a built-in vacuum pump. The instrument chamber accepts up to 52 BEEM specimen vials. Preset and user-adjustable programs coordinate temperature, pressure and pressure-increase-induced flushing. This results in an efficient and reproducible removal of solvent from the specimens. Initial steps aiming at bulk removal of solvent are followed by steps for the thorough removal of trace amounts. In practice: the instrument can be loaded with specimens in e.g. acetone/resin by the end of a workday. The next morning the vials are ready for polymerization once they have been topped off with pure resin to compensate for the removed solvent. Yeast cells were fixed with glutaraldehyde in cacodylate buffer, washed in distilled water and postfixed with 1% KMnO4 in distilled water. After washing in distilled water the cells were dehydrated in a graded series of acetone/water mixtures: 50% - 70% - 80% - 90% - 100% - 2x100% absolute. Each step lasted 10 min. Cells were then resuspended in resin/solvent 1:3 (v/v) in BEEM capsules. Once the BEEM vials had been transferred into the instrument chamber, the embedding program was started. Upon completion it was followed by the polymerization program, once the BEEM vials had been topped off with pure resin. 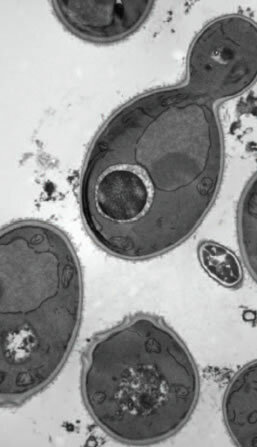 Acknowledgement: TEM image courtesy of OCEM, University of Otago. The efficacy of the approach was evaluated by embedding yeast cells (see image to right) in epoxy resin, using acetone as the solvent according to protocol. This leaves the specimens covered in a thin layer of resin by the end of the embedding run. J. J. Bozzola, L.D. Russell "Electron Microscopy 2nd edition", ed. Jones & Bartlett Publishers, Boston. K. L. McDonald, Microsc. Microanal. 20 (2014) 152–163. Vacuum conditions in a transmission electron microscope require that liquid water is removed from specimens before introducing them into the column. This is usually achieved by dehydration, i.e. replacing the water by a solvent such as acetone which in turn is replaced by a resin suited for ultrathin sectioning after polymerization. Resin embedding is traditionally performed using a graded series of dehydration solvent and resin mixtures. In the first step, the solvent / resin ratio is in favor of the solvent. This warrants low viscosity and thereby easy penetration of resin components into the specimen. Sequential steps aim at a stepwise increase in the resin concentration until finally the specimens are in pure resin, ready for polymerization. A protocol based on sequential steps can take up to 48, or even 72, hrs for specimens which are dense and hard to infiltrate. When during the embedding procedure a solvent-resin mixture is exchanged for a higher resin concentration mix, only the bulk of the volume is replaced; the specimen will slowly follow suit when the solvent diffuses from the specimen into the bulk mixture. This is a slow process as it is predominantly driven by diffusion and thus depends on the temperature and the viscosity of the resin. The exchange is furthermore driven by the difference in concentration of the solvent (gradient) and therefore depends on continuous refreshing of the bulk mix close to the specimen surface by liquid movement. Hence, the traditional way of embedding depends heavily on mechanical movement. Instead of removing solvent using sequential steps with increasing resin concentration, solvent can also be removed by making use of the volatility of the solvent. Common solvents for dehydration and embedding are highly volatile whereas most resin components do not evaporate readily. Evaporation depends on the kinetic energy of solvent molecules. If the kinetic energy is high enough, a molecule can escape from a liquid into the gas phase. From the liquid point of view the evaporation rate is therefore related to the temperature of the liquid but also to the interaction the solvent molecules may have with other molecules such as resin components. From the gas phase point of view the evaporation rate depends on how easily molecules can stay in the gas phase. This is temperature related as well, but also depending on the concentration of 'solvent' gas molecules and the presence of other molecules in the gas phase. A saturation condition is reached when as many molecules evaporate from the liquid surface as there are molecules from the gas phase returning to the liquid phase. This saturation condition is characteristic for each solvent and is reflected in the saturation vapor pressure. Saturation conditions and even near-saturation conditions are to be avoided for effective solvent removal. This is realized when the evaporated gas is continuously removed or diluted by forced movement of air over the liquid surface: an open container holding a volatile solvent such as acetone 'dries' more quickly at higher temperatures and under forced air flow. Air flow and on-going removal of the gas under vacuum prevent saturation. At pressures slightly higher than the values on the vapor pressure line the solvent will not boil but still evaporate. At pressures below the vapor pressure line the solvent will quickly evaporate by forced boiling. Vapor pressure, or more accurately saturation vapor pressure, is the pressure resulting from evaporation when the number of molecules leaving a liquid equals the number that return to it from the vapor/gas phase. The vapor pressure increases with temperature. By definition, at the boiling point of a solvent the vapor pressure equals 1 atmosphere (101.3kPa). Under lower pressure conditions the boiling point is reached at lower temperatures. 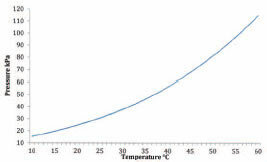 The vapor pressure graph presented in Figure 1 shows the relation of vapor pressure and temperature. The data were calculated using the so-called Antoine equation, which in its turn derives from the Clausius-Clapeyron relation that describes the tangent at any point of the coexistence curve of a phase diagram. where p =pressure (mmHg) and T temperature in °C. A, B and C are substance specific constants which are valid for a limited temperature range. The table below shows a list of constants for common solvents. Please note that these values apply to pure substances only. Mixtures incorporating the solvent will show lower evaporation rates and vapor pressures will take longer to establish, especially with gradually decreasing solvent concentrations. Data from DDSST GmbH, Germany. Many ultra structural studies involve the use of epoxy resins and acetone. Acetone is highly volatile. The vapor pressure curve for acetone is singled out and presented in Figure 2. 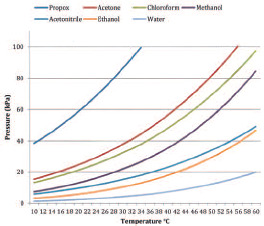 From the graph it is clear that at 25°C the vapor pressure is ~30kPa, in other words acetone boils at 25°C if the pressure is lowered to 30kPa or below. In the case of boiling evaporation occurs not only at the surface of a solution, but throughout the whole volume. This is unfavorable for embedding mixtures as it leads to splashing and potential loss of specimens. At pressures slightly above the saturated vapor pressure, evaporation is still proceeding progressively but only from the surface of the mixture. This is a safe condition for a mixture of resin and acetone to gradually evaporate acetone from the surface. When a preset raise in pressure is exceeded, the pressure is released by air admission into the recipient up to a preset level. The evaporated acetone is diluted with air and removed by the vacuum pump. The dilution prevents that saturation will ever occur. The remaining mixture will become more concentrated in resin. Thus by carefully controlling temperature and vacuum pressure, air admission and flushing the acetone can be removed quantitatively and within hours; upon completion the specimens are left in for all practical purposes pure resin ready for polymerization after topping up with pure resin to compensate for the removed solvent. From the graphs it is obvious that fluctuations in temperature as well as in pressure may seriously influence the evaporation process. Without proper control of the vacuum pressure and the temperature the solvent may boil off explosively when the saturated vapor pressure is undercut. Furthermore, extraction of solvent forces the release of the latent heat of evaporation which leads to a significant drop in temperature in the mixture and concomitantly a drop in the evaporation rate. It is imperative that the conditions of pressure and temperature are thoroughly controlled.